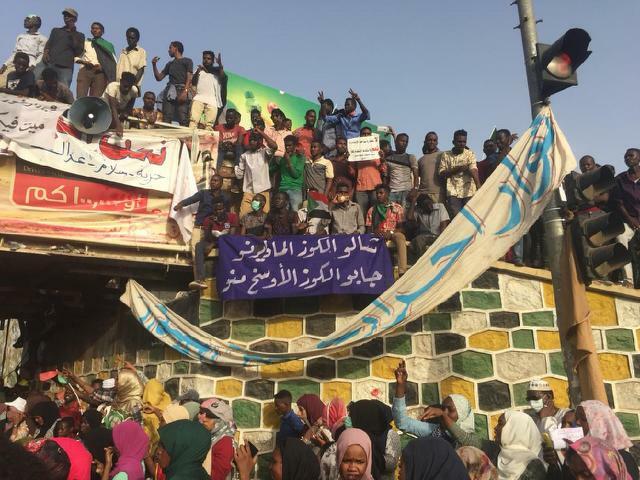 Khartoum (AFP) – Jubilation in Khartoum that Sudan’s era of iron-fisted rule by Omar al-Bashir was ending Thursday quickly soured when protesters realised the old regime had no plans to go. “Change will not happen with Bashir’s entire regime hoodwinking Sudanese civilians through a military coup,” tweeted Alaa Salah, who has become an icon of the protest movement after a video of her leading demonstrators’ chants went viral. But after the army’s announcement the celebrations evaporated, and the tone hardened. “We are not leaving, we are not leaving. Just fall and that’s all,” some protesters in front of the army headquarters began chanting. “I cried when Ibnouf made the announcement,” said Heba, carrying a Sudanese flag, as she prepared to spend the night at the complex. Behind her crowds were chanting their slogan “peace! justice! freedom!” as they thronged the complex for a sixth night running. “This is a farce. The regime did not fall. This is a reproduction of the same regime,” one demonstrator told AFP, gesturing emphatically. “This man (Bashir) is a bloodthirsty leader and he is wanted, he brings us another regime. This is completely unacceptable,” added another. As activists began telling protesters not to leave the site despite the curfew, one woman in a bright red headscarf also dismissed Thursday’s events. Abdel Wahid Nour, head of the rebel Sudan Liberation Army-Abdel Wahid (SLA-AW) group fighting government forces in Darfur, denounced what he called a “palace coup”. “What has been issued in the statement is recycling of the regime with new faces,” he said in a statement. “We will not let the blood of our brothers be lost for nothing. This is a new duplicate copy of the existing regime,” one protester vowed.